SIMPSON BAY, St. Maarten (February 10, 2014) Considering that effective connectivity is a critical factor in increasing the hub function of the Princess Juliana International Airport (SXM), members of the Air Service Development Committee (ASDC) have called on regional airlines, LIAT and WINAIR to work together to achieve this goal. 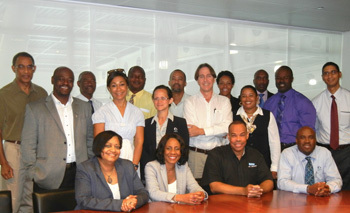 They made the call at the inaugural meeting of the Committee set up to further develop air service to SXM. The meeting was attended by representatives from the country partners, St. Maarten, St. Martin, Anguilla, St. Barths, Dominica, St. Eustatius, Nevis, as well as regional carriers LIAT and WINAIR, and St. Maarten Immigration officials. The country partners said they recognize the importance of SXM Airport’s contribution to the success of their respective economies and agreed to work with SXM to make it an effective hub. The ASDC meeting further concurred that service to and from London would be a welcome addition and pledged to cooperate with SXM Airport to make this a reality. While the airport is not responsible for the physical movement of passengers, it is part of its tasks to create an environment that would encourage airlines to provide the much needed connectivity. - Joint marketing to maximize airline seating capacity to ensure profitability for airlines. The ASDC is in the process of creating a complementary brand that would reflect the partnership among all participants and country partners. The next meeting is scheduled for mid-March.